The Guinea Nest is a beautiful log home on a wooded lot with big water views, ideal for a family vacation, weekend getaway, or a fishing trip. A large, partially covered deck overlooks the spacious lawn, water front, dock, and two to five miles of Lake Murray's gorgeous open water. The deck also has two picnic tables as well as a smaller table and chairs to enjoy an outdoor lunch or moonlight dinner. There is plenty of additional seating if you want to just sit back, relax, and enjoy the day. An indoor wood-burning fireplace with plenty of wood makes for a cozy setting when the weather is chilly. An outdoor fire pit at the water's edge is another option to enjoy a mild or cool evening. The dock includes a bench for seating, umbrellas and plenty of area to sunbathe, two sets of stairs for easy access to and from the water for swimming, and water deep enough to handle your motor boat. There is a two person canoe with paddles and a paddle board for your enjoyment. 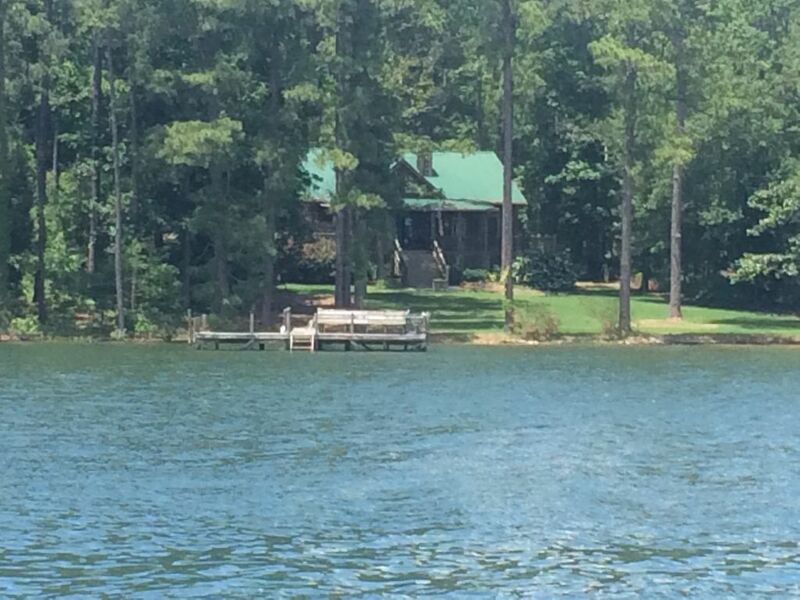 Our home is on the quiet side of the lake with minimal boat traffic and only two neighbors. Only 45 minutes from Columbia, 50 minutes from Fort Jackson and 60 minutes from Augusta National Golf Club (home of the Masters Tournament), the Guinea Nest is perfect for a graduation celebration, USC sports and graduation weekends, or trip to the Masters. "Clearly, the energy of love and family is strong and powerful here. We all felt it immediately upon entering the house." - This comment from a guest in a hand-written note exemplifies how we feel about the Guinea Nest and hope you will too. Coming to Columbia for a USC football game? The Gamecocks have 7 home games in 2019. The first round of NCAAM basketball tournament is being held in Columbia March 22/24. We're an easy 45 minute drive from the Colonial Life Arena (CLA). Sorry, no events (such as wedding parties, bachelor or bachelorette parties). Our parents purchased this property in 1961 so our family would have a vacation home to enjoy. We have many great memories as children here and have now made more memories with our own children and are beginning to do so with our grandchildren. The Guinea Nest was originally just a shack and a one-room, hand made log cabin. In 2007, we razed the old structures and built this new and updated log cabin so our families would have plenty of room to continue to grow together. A great place to relax and play. toilet, shower, Double sinks with wide vanity. toilet, combination tub/shower, Double sinks with wide vanity. outdoor shower, Includes hot and cold water, no sink or toilet. Two bathrooms. The east bathroom has two sinks with full vanity surface, shower and toilet. The west bathroom has two sinks with full vanity surface, tub/shower and toilet. Big water view. This property faces south which means no blinding afternoon sun. Large lot with plenty of parking, privacy, and grass lawn. Folded linens will be placed on each bed. Firewood is available. Also, a fire pit at the water's edge. Ample parking for cars and boat trailers. Bath towels, only. Guests should bring their own beach towels. Great room with vaulted ceilings. Four ceiling fans in the great room. Double door with drawer freezer and ice maker. Salt, pepper and other spices are supplied. Also, some paper products such as napkins and plates. Full compliment of dishes and utensils. Modern kitchen with all amenities; convenient island, pantry, and cabinets. Please use disposal sparingly, as house is on a septic tank. Beautiful dining table seats 8 comfortably or 10 otherwise. Kitchen area island has 3 bar stools. 40 inch, flat screen, high definition TV. Built in to a smaller, separate TV (flat screen). Corn bag lawn game. Also some board games. Beautiful grass lawn about 10,000 sq ft.
One paddle board that can be operated from a standing position or a seated position. Canoe with paddles is also available. Life jackets are supplied for use with paddle board and canoe, ONLY. Boat rentals and fishing guides are available in the area. The owner/manager, depending on availability, offers lake tours via boat for a reasonable fee.